NEW YORK - A family that owned several failed Burger Kings is suing the fast food giant, claiming the company's $1 value menu made it impossible for them to turn a profit in high-priced Manhattan. 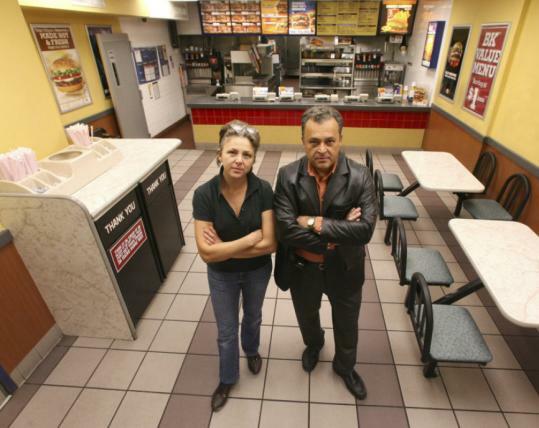 Franchise owners Elizabeth and Luan Sadik say in a federal lawsuit filed last month in Brooklyn that they begged Burger King for permission to raise prices at their Midtown restaurants so they could cover their high costs. One of their eateries near Grand Central Terminal was paying $18,000 per month in rent, an amount they said they couldn't cover selling hamburgers for $1. Burger King said no, and when the family closed two unprofitable Manhattan restaurants in response, the company took legal action to shut down two of their remaining New York eateries. The last one closed six weeks ago. Now, the sister and brother team is suing to force Burger King to cover some of the costs of the failed business. A spokesman for Burger King Holdings Inc., Keva Silversmith, said yesterday the family's claim was unfounded. "We have no evidence that the value menu has hurt restaurant profitability," he said. On the contrary, he said, internal studies have shown the promotions to boost store profitability. A lawyer for the Sadiks, Richard Gallucci, said the family wouldn't have been in this mess if it wasn't for the value menu. Other Burger Kings in high-rent locations, like airports, have been granted an exemption from the promotion.